The Torus Design concept was inspired by the movie Thrive, which outlines ways of creating prosperity and equality in the world. The design brings together three emerging trends: increasing self sufficiency — including renewable energy and food production, families moving back together to save money, and sustainability. 2,224 sq. ft. interior, 564 sq. ft. greenhouses, 1,520 sq. ft. courtyard, each side has two bedrooms, two baths. The Fourplex is a potential investment property that features numerous sustainable building features, including earthbag walls, superinsulation package, and compact and efficient design. Four units, each 462 sq. ft. interior, 1 bedroom, 1 bath; footprint: 48’x48′ plus 8′ wrap-around porch. With these Modular Pods you can configure them in many ways, with as many as you want. Pictured is the simplest two-pod model. This enables the home to be built one stage at a time, with tremendous versatility in room arrangement. The Earthbag Castle consists of four structures: Custom Chonburi main residence, Two-story Roundhouse Above Survival Shelter, Carriage House with second floor garage apartment, Guard Tower tool shed. All structures include a waterproof roof deck with ladder access and crenelations capped with cement or geopolymer. The Earthbag Dome Fort showcases individual designs and combines them into a self sustaining, fortified homestead, where a group of 5-20 people could weather economic and social upheaval. This is a concept drawing that does not show every possible type of defense. What is the estimate number of bags will i need to buy to build a Beach House of 1 Bedroom,1 Fold-out bed, Kitchen, Living room and Bath room with toilet and how much are they in Namibian Dollars and what are the modes of payment will be entertained in this regard? You can follow direction posted at http://earthbagbuilding.com/faqs/howmany.htm to approximate how many bags you might need. Cost and payment depends on where you buy them. 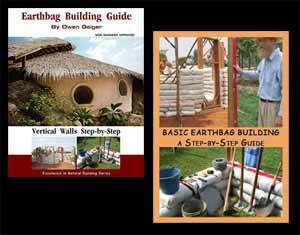 I would appreciate any information anyone can supply about sand bag or earth bag building codes in Arizona. I live in Prescott area and want to build one of these for my own home. Search our blog post Counties with Few or No Codes. Talk to the local building officials and get a packet for owner-builders. Bring some earthbag materials such as photocopies of recommended websites to show them. At some point you’ll probably want to contact Structure1.com for a free estimate. They can get your plans approved.